This beautiful no-bake frozen peppermint pie is sure to steal the show at your Christmas party. It's a super easy recipe that even kids can help make and decorate! A few years ago, we made a frozen minty-green grasshopper pie for St. Patrick’s Day. It was an instant hit for its wonderful cheesecake-like texture and mint flavor! I’ve made it for St. Patrick’s Day and even Artistic Alex’s birthday. 🎨 I decided to adapt that recipe to make a festive pink peppermint pie, and make it pink instead of green! This pie is super easy to make, and even kids can do it! Just make sure to make the pie 20 hours before you want to serve it, since it tastes best thoroughly frozen. ❄ I’ve linked this recipe to how to make your own Oreo pie crust, just in case you don’t have a store-bought one in your pantry! 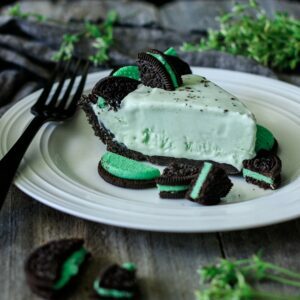 No Bake Frozen Grasshopper Pie: a festive St. Patrick’s Day dessert your family will love. Did you make this no bake frozen peppermint pie? Please leave a star rating below the recipe to share how you enjoyed it. This beautiful no-bake frozen peppermint pie is sure to steal the show at your Christmas party. It’s a super easy recipe that even kids can help make and decorate! Place the cream cheese in the bowl of a stand mixer and beat with the paddle attachment until smooth, then scrape down the sides of the bowl. Beat in the sweetened condensed milk on medium-high speed until smooth. Add the peppermint extract and a drop of red food coloring, then blend until well mixed. Add more red food coloring to get the desired shade of pink. Whip the whipping cream until it holds its shape, but is not too wet, then fold it in to the peppermint mixture. Pour into the Oreo crust and smooth with a rubber spatula. Freeze for at least 20 hours before serving. Whip the cream until stiff peaks form. Spoon it into a piping bag fitting with a star nozzle. Crush 6 peppermint candies in a sandwich bag with a rolling pin, then crush the Oreo cookies in another sandwich bag. To decorate, pipe continuous swirls of whipped cream around the edge of the pie. Decorate with peppermint candies, crushed Oreos, and crushed peppermint. Serve the pie frozen. Change it up a bit by adding more crushed Oreos, crushed peppermints, or other peppermint chocolates. Feel free to drizzle melted dark chocolate on top of the frozen pie before the whipped cream goes on as another layer to your decorative pie top. Another idea is to cut Oreos in half and place them around the edge of the pie before it’s frozen. If the frozen pie is too hard to slice, let the pie sit on the counter for a few minutes and run your knife under hot water before slicing. If you’re serving this pie at an event, pre-slice it at home into 16 pieces. If you do this, it will be so much easier for people to help themselves. If serving at an event, consider placing the pre-sliced pie on top of crushed ice so it stays frozen longer.